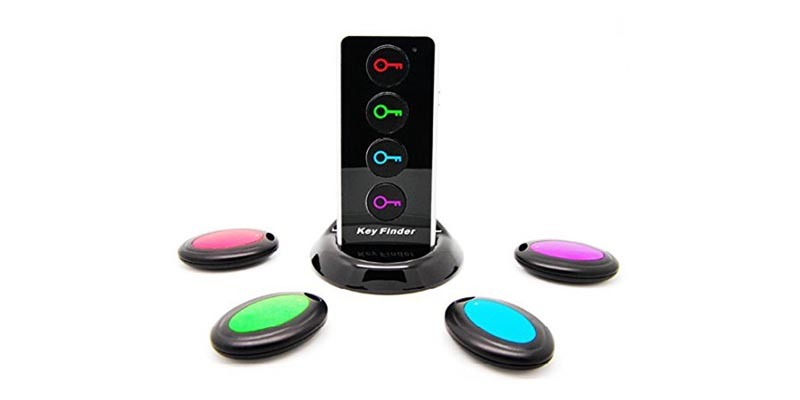 Click n Dig Key Finder Wireless RF Item Locator – this key or other item remote finder is a convenient gadget that can find items up to 60 feet away even if hidden under other objects and out of sight. The radio frequency easily penetrates walls so you need never lose your important small items like keys, wallets or remote controls again! There are a total of 4 receivers included. 2 Key ring types and 2 thin plates for putting in wallets or on back of remote controls etc. Batteries (including spare set) are included. Wireless RF Item Locator Key Finder with Base Support and LED Flashlight – this device from Dante Products makes finding your keys so easy, attach the receiver to your keychain, then to find your keys simply press the button on the transmitter and the receiver will emit a few short beeps so you can find it. Can be used on keys, mobile phones, wallets, purses, TV remote controls and anything else you are in habit of misplacing! The receivers are nice and loud so you can hear them in other rooms and from quite a distance, plus the included LED torch is useful too if you need to find something in the dark! Yarrashop Smart Tag Nut 2 Bluetooth Key Finder – compatible with iOS and Android this tiny Bluetooth tracker can be attached to your phone, or keys, wallet etc and can then be “rung” from the mobile app. You can attach the Nut Smart Tag to anything you don’t want to lose and the app will even remember the last place it saw your Nut on a map, so you know where to begin looking! The Nut is a tiny Bluetooth finder which is small and can easily be slipped into a wallet and has a standby time of up to 6 months, after which, the battery can be easily replaced.